I’m very excited to be included to participate in the Bergen County (NJ) Cooperative Library System’s BooksNJ2017 event. I’ll be ready to discuss and display the Frank Nagler Mysteries: “The Swamps of Jersey,” the award-winning “A Game Called Dead,” and the newly released, “The Weight of Living.” Available at Amazon, Nook, Kobo and Wal-Mart. The event is held every other year and draws thousands of readers and book lovers to the Paramus Public Library, 116 E. Century Rd, Paramus. I attended BooksNJ2015, which drew over 3,000 people. BooksNJ2017 is from 1 to 5 p.m., June 11. The event is still being organized. For information: http://www.booksnj.org. 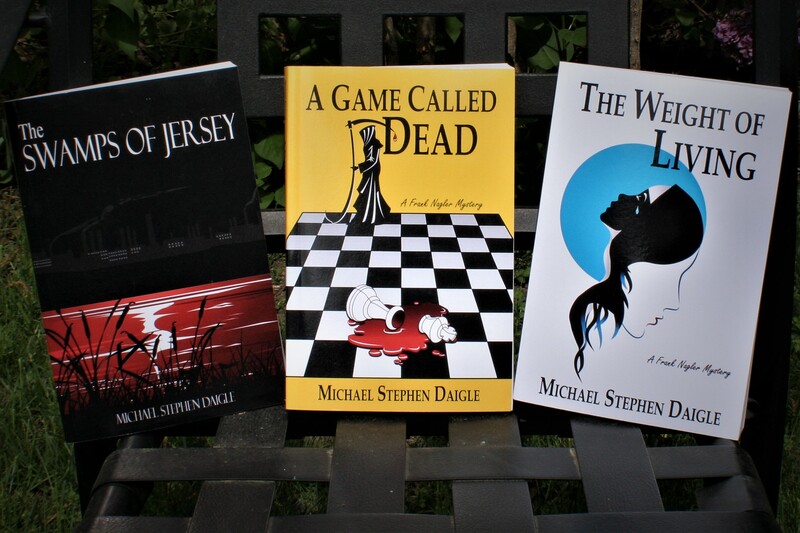 This entry was posted in Bergen County Cooperative Library System, Fiction, Hot in Hunterdon; Georjean Trinkle, http://www.sallyember.com, Imzadi Publishing LLC, Michael Stephen Daigle, Mystery Writers of America, www.michaelstephendaigle.com and tagged "A Game Called Dead", "The Swamps of Jersey" Imzadi Publishing, "The Weight of Living", Fiction, New Jersey. Bookmark the permalink.